Surprise, surprise, TCU is changing conferences again. The Horned Frogs will join their fourth conference since the dissolution of the SWC in 1996. First, it joined the WAC superconference. Shortly after the MWC teams left the WAC, it moved to the CUSA. Then it jumped to the MWC. Now it will be in the Big East, starting in 2012. I understand that football teams must start in a new conference by 2012 in order for its statistics to count in the new conference for BCS purposes. The current evaluation period is between 2008 and 2011. It has driven me crazy that a team in Fort Worth, TX, belonged to the Mountain West Conference since they joined, but they’re moving to a conference that, at least as compared to the current MWC, makes even less sense geographically. Plus, TCU has a basketball team, so that will be 17 members of the Big East. That’s beyond ridiculous. I think they should make it two separate conferences for the purposes of other sports. Will there now be a play-in game to reach the 1st round of the basketball tournament, where the four winners then get a chance TO PLAY FOR a spot in the quarterfinals? The travel times listed below are based on Google Maps driving directions. The longest trip will be 28 hours away (it doesn’t give minutes when you go over 24 hours). In the MWC as currently constituted, the longest trip (San Diego St.) was 21 hours, 19 minutes. But to be fair, it could have gotten worse had TCU stayed. Boise will be 26 hours away, but Hawaii (if they choose to join the MWC) would have been even farther away, about 2900 miles, almost 1200 more than the distance to Connecticut. There is of course no driving time to Hawaii. Confirmed new additions to the MWC, Nevada and Fresno St., would have also been farther away than any current MWC team. Obviously, there are other reasons, but it’s interesting that three teams have now left the MWC since it was announced that Boise St. was joining. No one wants to play them, unless it’s another team that wants to go out its way to prove itself (I’m sure Fresno St., for instance, was happy to follow them to the MWC). As I referenced in the second paragraph, I also read that apparently these moves are all about jockeying for automatic qualifier status. TCU’s BCS appearance last year will count toward the Big East, Boise’s will count toward the Mountain West, and Utah’s in the 2008 season will count toward the Pac-10. Hawaii’s BCS appearnce in the 2007 season apparently doesn’t matter, so the WAC could really be deprived even if Hawaii stays. The WAC might be the new Sun Belt when all is said and done. Idaho, Utah St., and New Mexico St. were all Sun Belt teams at one point, incidentally. San Jose St. isn’t much better. Louisiana Tech (another severely out-of-place team) actually won the WAC in their first season in the conference, but it’s been pretty much downhill since then. Those five teams are the only ones left if Hawaii also leaves. Maybe they’ll add some California FCS teams, but I think the last thing we need is more FBS teams. The Sun Belt is getting bloated, maybe a some of them will go out West (there are two Louisiana teams and one Texas team who might go well with Louisiana Tech). The Sun Belt is currently scheduled to have 10 football teams with the addition of South Alabama in 2013. I don’t know if Denver plans to field a football team, but they are moving to the WAC, where BYU will also play in sports other than football. The Big East is also considering adding Central Florida and Villanova, should the latter choose to move up to FBS. Central Florida would increase the number of basketball teams to 18. I don’t know if there is any interest in bringing Temple back to the Big East, but that would be a more logical fit than the MAC, especially since the Owls have been improved in the last couple of years. It would also be a good basketball program to add, though its previous membership in the Big East was football-only. Temple would also of course be a natural rival with Villanova. The teams have already played each other multiple times in recent years and have an intense basketball rivalry. I don’t think either team will have it easy this week, but I expect both to come out on top. I just don’t think the opposition is good enough. On the other hand, just ask Bobby Bowden how tough it is to face a rematch with Steve Spurrier. A Pac-10 or Big Ten national-championship-game team would automatically send TCU to the Rose Bowl. It’s not right for Stanford, but that’s the breaks. So the Rose Bowl doesn’t really get to pick a team. So there is the second match-up: Wisconsin (projected Big Ten champion based on BCS standings) vs. TCU. This would probably leave an automatic #4, probably Stanford, Oklahoma or Nebraska as the Big XII champions, Virginia Tech or Florida St. as the ACC champions, and probably either Connecticut or West Virginia (Pitt would only make it if both lose) as the Big East champions. This leaves open the possibility of two non-automatic at-large teams. The Sugar Bowl gets the first two real picks, the replacement for Auburn and the regular first pick. I think they’d definitely pick Arkansas (leaving only one other non-automatic slot). They might like to pick the Big XII champion, but they’re contractually obligated to the Fiesta Bowl, so my guess is they knock out that last non-automatic spot and pick Ohio St. The Buckeyes were in a New Orleans bowl game in 2007 (the national championship game), but I still think the team and fan base are the most attractive option. I don’t think there is enough of a gap between Stanford and Ohio St. to ignore all the other positives for Ohio St. The Orange Bowl will have the ACC champion automatically, and they’ll get to pick a second team. Especially if it’s Connecticut, I don’t think they’d want the Big East team instead, so my guess here would be they’d take Stanford. Even if WVU wins the Big East, I don’t know if you pick a team that’s 20 spots worse because their fans are better. The Fiesta Bowl will automatically get the Big XII champion, and they’d be stuck with the Big East Champion, assuming no one else selects that team. CapitalOne: LSU vs. Michigan St.
Outback: South Carolina vs. Penn St.
Peach: Virginia Tech vs. Florida or Florida St. vs. Mississippi St. I also think it would be interesting if maybe the Sun Bowl (which used to be somewhat important) matched Notre Dame and Boise St., since there aren’t enough Pac-10 teams and Notre Dame can go to the Big East bowls, but Notre Dame would probably prefer not to play Boise St. anyway. It would be a shame for Boise St. to have to play a team that’s even worse than that. Boise St./Utah would be a good out-west game (the Las Vegas Bowl would be a possibility, since that’s another open Pac-10 spot), but Boise might be possessive and the Broncos could be stuck on the blue field for the Humanitarian Bowl. This has been by far my best day in terms of views since starting my blog here, so thanks for checking in. Some have over-reacted to some of the top teams here, so I decided to do projections. I did the first round after Friday and I mentioned those results in my LSU-Arkansas post-game blog. I have an initial rating that I give teams in order to know how much to add and subtract for beating or losing to each team. I just put down the teams with the higher initial rating as winning, and this goes through the Army-Navy game. It’s unofficial, but I went with Oklahoma as the Big XII South champion. People are going to say different things about LSU here, so I thought I would refute some of those things before they were said. They’re going to say LSU had no defense or poor defense (although to their credit, Lou Holtz and Rece Davis did not say this). That’s not really accurate. There were a number of really good plays that went out of the window with just a couple of bad plays. The first long Arkansas touchdown wasn’t a bad play really. There was just a small window of room along the sideline (along with what seemed to be a bad angle by the defender) and Arkansas was able to exploit it. It was a very good read by Mallett, an even better throw, and a good job by the receiver in figuring out how to get to the end zone. I was just watching the Dolphins and the Raiders, and Miami had a similar touchdown where the corner took an angle toward the sideline and up toward the receiver, allowing him to go up the sidelines, so it wasn’t a horribly bad defensive play. But the Arkansas touchdown to end the first half was deadly. Beuerlein said it was because LSU didn’t play prevent, but I disagree. LSU had enough people back behind the play, but the two initial defenders collided, allowing the receiver to get the angle to the end zone without having to slow down much. I understand the LSU defender who made the jump was trying to make a good play, but the only play necessary or even helpful was anything that stopped Arkansas from scoring. It wasn’t a smart move, but it was still a freak accident that the play eliminated the other defender and resulted in an 80-yard touchdown when there were 6 seconds left in the half when the play began. Then, LSU made a number of good plays to get Arkansas into a 4th and 3 situation outside of field goal range. But Arkansas, who just like Ole Miss last week was the team who took more chances, went for it, and the LSU player (1) allowed too much of a buffer and (2) bit on a hesitation by the receiver, allowing another crucial touchdown. The play-calling wasn’t ideal there either. So those two plays alone were 120 of the passing yards (officially, 119) by Arkansas, more than 200 when you add in the first long touchdown. Arkansas only had 116 passing yards apart from those three plays. This was an interesting read on a couple of the big plays LSU has given up in recent weeks. I don’t agree with any implication that Hatcher missed anyone on purpose. It just seems like a lack of awareness, but regardless of what the fundamental problem is, sometimes a defense is no stronger than its weakest link. There are parallels to when Alabama’s Julio Jones scored a touchdown last year, it was just one odd play that Patrick Peterson happened to be on the sidelines. LSU had only four returning starters on defense, and in just a few situations, enough to keep LSU out of a BCS bowl, it showed. For an SEC game, the officiating was very good, but LSU still got the short end of the stick, particularly before LSU’s field goal that closed the gap to 21-20. The LSU receiver was hit multiple times with the ball in the air. He was not knocked down or completely stopped from catching the ball, but that was pretty clearly an interference. I don’t think that Arkansas stops LSU from scoring a touchdown if LSU gets a first and goal from the 2. So if you take just a few plays, maybe even just two of them, and they go differently, LSU likely could have just run out the clock at the end of the game. I didn’t even mention the two times LSU had the ball on the ground and just didn’t get down on the ground properly to it. One of them led to Ryan Mallett throwing an interception in the LSU end zone and the other led to a missed field goal by Arkansas; but the latter would have given LSU the ball deep in Arkansas territory, possibly leading to a touchdown, and the former could have averted the whole situation at the end of the first half. Of course there were similar blown opportunities for Arkansas, so I don’t know if that was a distinct LSU disadvantage in that aspect. People are also going to say LSU was overrated. Nonsense. A one-loss SEC team, in the better division in an unusually unbalanced year, with two strong non-conference opponents, deserves to be 5th at the absolute worst. Anyone who didn’t think Arkansas had a decent chance to win was crazy, but even if you thought Arkansas was going to win (and to be honest, I did), when schedules are that similar, a two-loss team doesn’t go ahead of a one-loss team. No, I don’t realize that, either from the typical team vs. team arguments or from the numbers I add into the formula. I would have absolutely no confidence that Oregon would go to Arkansas (or to Alabama, for that matter) and win. They struggled to beat Cal (who just finished 5-7) the last time they went on the road, and I’m supposed to believe they’d beat Arkansas? Furthermore, Oregon had one fewer game behind it going into this week. I did a projection after Friday’s games of what would happen if all the more highly-rated teams won. Oregon came out ahead of LSU. Just barely, so I don’t know for sure if that would have happened had both teams won out, but that’s something I just can’t get people to understand. There is no element of projection or prediction in my ratings. It’s all about what you and your opponents (and your opponents’ opponents) have done so far. As a side note, Oklahoma St. was still in the mix too, but not anymore. What most pollsters are saying when they vote is that they would expect the higher-rated team to win a neutral field, and also that by winning (unless it’s a particularly ugly game) a team is going to stay put. To rank a team as such, you have to believe they will eventually be challenged enough to justify the ranking. So those are two forward-looking aspects that I do not measure. I’d rather know the cold numbers of who has done what to this point, and I do feel that my ratings give those numbers. People are also going to say Arkansas was just the better team, but I don’t believe that. I do believe that about Auburn (even though LSU had plenty of opportunities to win that one as well), but this was just two good teams and while neither played particularly well, LSU didn’t take advantage of its superior talent, in my opinion. The offense was adequate, which is a victory as far as that’s concerned for LSU this season, but the defense just wasted a vast majority of really good plays with those few bad plays, and it sort of snowballed when they were worn out at the end. Certainly there were games where LSU didn’t even play like a top 60 team (at least not on offense) and came away from a win, and this was not a good enough performance to feel cheated at not getting a win. But with the game Arkansas played, it’s very disappointing that LSU didn’t take advantage nearly the way they could have and should have. That happens in these tough environments though. That’s one reason LSU has never won the West in an even year: trips to Auburn, Florida, and Arkansas. I won’t be upset if Arkansas goes to a better bowl game than LSU will. North Carolina and West Virginia, even though that’s two good games instead of one, are not as good as Texas A&M, whom Arkansas played and beat out of conference. LSU usually has a tougher SEC schedule, but that wasn’t the case this year: Arkansas played South Carolina and Georgia, and LSU played Florida and Tennessee (both played Vanderbilt). I think losing to Arkansas and Auburn is better than losing to Alabama and Auburn, but I think combined with the considerations above, you also go with the hot team. Arkansas is 6-0 since October 19, and LSU is 3-2 since October 19. I’m afraid LSU is going to have another uninspired bowl game. You play the whole season like this with only one loss to the #1 team in the country, playing for a BCS bowl or even a possible championship-game berth (which looked even more possible for a good 14 hours), and now you’re not playing for anything*, and you have a month off to think about it. And whoever LSU plays has a chance to knock off an SEC team that has two BCS national championships in the previous seven seasons. * I’m not trying to be obnoxious, but a second-tier bowl trophy doesn’t really amount to playing for anything if you’re a team like LSU. I certainly haven’t forgotten when LSU went all those years (6 in a row and 8 of 11) without going to any bowl game, so a 10-win season is always a success to me, but I remember a lot more bad LSU teams than teenagers on the team do, and the players on this team expect much bigger things for themselves than the early 1990s LSU players did. We’re playing for division championships, then conference championships, then national championships if that’s available. If we can’t get one of those, we’re playing for BCS bowls (like in 2006). Playing for a nice win on TV (which is much of what those games are about) is such a huge step down from there, putting the game lower than at least a few regular-season games, I just don’t expect that there will be much passion in the bowl preparation even though this coaching staff is very good at bowl preparation. A note on Les Miles after his 6th regular season. Miles has won 78.2% of his games at LSU, but this would have been the first time that the Tigers started 11-1 under Miles. He is 0-3 in games that would have given the Tigers an 11-1 record, including 0-2 against Arkansas in such games. (In his first season with the Tigers in 2005, the 12th game was the SEC Championship Game against Georgia.) I’m going to re-publish and update my rivalry blog about Arkansas, which I mention because such happenings have been common in the LSU-Arkansas series. Apologies to anyone upset, as some have been in the past, with my anticipation of arguments, but it’s just easier to address them at the outset. Feel free to come up with some I did not so easily anticipate. Hopefully, the combination of right now and recent history will serve LSU well on the recruiting trail. By the way, that’s another important aspect of the bowl game LSU will play in, but again, it’s probably a tough sell on the players. 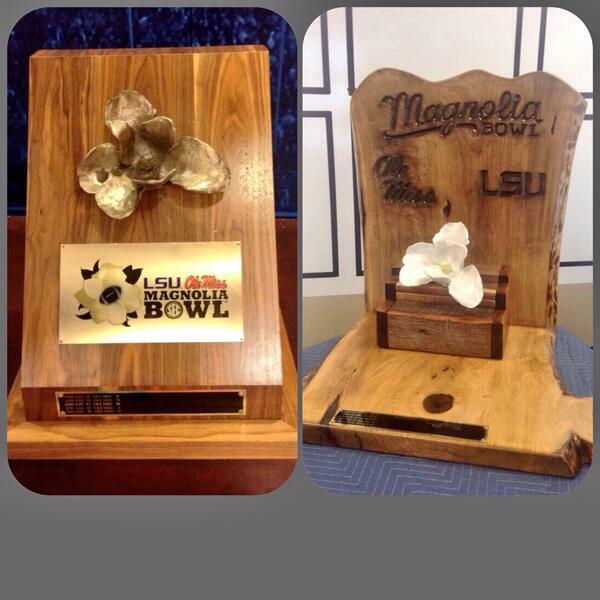 In recent years, the winner of the LSU-Ole Miss game has taken home the Magnolia Bowl Trophy. The magnolia is the state flower of both Louisiana and Mississippi. Apparently, Ole Miss destroyed the original in 2013, so the new one is the one on the right. Most of this blog (except for a few changes to the series notes and mentions of subsequent games at the bottom) was originally posted on the SportingNews on November 16, 2007. The “Go to Hell series” is so named (by me at least) because both sides involve that phrase in chants directed against the other team. Ole Miss (107 meetings as of the 2018 game) is LSU’s second most-common opponent after only Mississippi St. (110 meetings). 2018 was the 73rd season in a row the two have played. The only longer current streak for LSU is 73 (Mississippi St.). Tulane, which stopped playing the Tigers yearly after 1994, played LSU 83 consecutive LSU seasons (76 consecutive Tulane seasons). Mississippi St. is also Ole Miss’s only more-commonly-played opponent, having played the Rebels on about 10 more occasions. LSU won five in a row overall in the series from 2002 to 2007, but Ole Miss won the next two (see final paragraph below). From 2003 to 2007, LSU won 3 in a row in Oxford for the first time ever (although LSU did win 3 road games in a row from 1907 to 1917). The Tigers were of course a few yards or a few points away from extending their road streak to 4 for the first time. Before 2013, LSU had won three games in the series in a row and 9 of 11 after Ole Miss won 4 of the previous 5 meetings. LSU also went 8-1-1 from 1976 to 1985. Ole Miss had a comparable streak when the Rebels went 6-1-1 from 1962 to 1969. At home, the Rebels went 5-0-2 from 1952 to 1969 for their best streak. LSU won 4 road games in a row from 1985 to 1991 and from 2000 to 2007. LSU won 8 home games in a row from 1970 to 1984, but before World War II the Tigers had won 10 in a row (1916 to 1937). Until 1914, the series was fairly back-and-forth, played in a variety of locations (New Orleans, Vicksburg, Meridian, and Jackson, as well as Baton Rouge), was not played every year, and neither side dominated. There was no streak of more than 2 wins by either side until 1917. The Rebels’ only leads and ties in this series were during this time period. They led 1-0 and 2-1, later tying at 3, 4, and 6 (in 1914). LSU would only lose once in the series from 1915 to 1937, although, to be fair, only 5 of those 15 games were played outside of Baton Rouge. Ole Miss responded by winning 4 in a row, all in Baton Rouge. The 1938 win ended the Tigers’ longest home streak of 18 games, which was not surpassed until this season. After LSU won 5 of 7 from 1942 to 1950 (all in Baton Rouge), Ole Miss won 6 in a row (after the 1951 tie) under John Vaught (as in Vaught-Hemingway Stadium) despite only playing 2 of the 6 in Mississippi. Vaught would go 15-7-3 against the Tigers. LSU still led the series by over 10 games. After the 1926 game, the series was only interrupted in 1932, 1935, 1943 (no Ole Miss team), and 1944 (shortened schedule). It has not been interrupted since. 1958 to 1972 was the most meaningful stretch in the rivalry. Ignoring ties, LSU won 77% of its games during the period, and Ole Miss won 75%. Neither side had a losing season during that stretch and each went undefeated and untied once. Ole Miss went 10-0-1 one year (1960) also, the tie coming against the Tigers. Although book-ended by LSU wins, Ole Miss went 8-6-2 against the Tigers during that period. During the stretch from 1951 to 1969 (which includes LSU’s wins in 1958 and 1959), LSU only won 4 times. The Rebels went a total of 12-4-3 in that latter period of time, getting within 4 games of LSU for the overall series. The Rebels’ six-game winning streak over LSU ended in 1958, 14-0. LSU had gone into the game as #1 in the AP poll, #5 in the UPI, and Ole Miss had been #6 in both polls. The next week, LSU moved up to #2 in the UPI and passed up Iowa, who had been tied, the week after that. LSU would go on to win its only undefeated consensus national championship to date. The Tigers remained #1 until facing the Rebels on that Halloween night the next year, when what is considered the greatest play in LSU history took place. Ole Miss was also undefeated at that time, ranked #3 in both polls. Ole Miss led, 3-0, going into the fourth quarter. The defensive struggle continued, forcing Ole Miss to punt in the opening minutes of the fourth. Back to receive was a well-known halfback by the name of Billy Cannon. Cannon was UPI and TSN Player of the Year the year before, as well as earning several other national, regional, and position honors. I don’t know if it was a breach of ethics to punt out of bounds back then or what, but the ball went right to Cannon (off of a bounce), and the rest is history, memorialized in a grainy videotape (which you’ll almost certainly see whenever the game is broadcast). Cannon broke at least 7 tackles–and it seemed the entire kicking team had a shot at him at some point–as he scored the only points in the game (except for the extra point) for LSU, which won 7-3 after a goal line stand. Cannon, a Philadelphia, MS, native, would go on to win the Heisman Trophy. It was LSU’s 18th victory in a row, but the Tigers’ streak ended in Knoxville (where the Tigers had never won despite it being their 7th try) by 1 point the following week, and national championship hopes all but ended when the Rebels would pass up the Tigers in the polls after defeating the Volunteers. Syracuse would win the national championship and defeat #4 Texas in the Cotton Bowl. LSU, ranked #3, was matched up with the #2 Rebels again in the Sugar Bowl, which in a way functioned as the first SEC Championship game, and Ole Miss won 21-0. LSU did not make it past the Ole Miss 38. After the tie in Oxford ruined Ole Miss’s perfect season (likely costing them a national championship) later in 1960, LSU would win in 1961, 10-7. The Rebels then went 4-0-1 over the next five years. The Ole Miss wins in 1968 and 1969 were each by 3 points and each with Archie Manning at the helm. Manning was so successful at Ole Miss that the speed limit on campus is still 18, his number as a Rebel. The Tigers would take out their frustrations on him in 1970 though, winning 61-17, LSU’s biggest win in the series since 1917. Ole Miss responded with another nail-biter win in Jackson, by only 2 points this time. Vaught originally left Ole Miss after the 1970 season, then came back for one year in 1973, but he couldn’t beat the Tigers, although that team won 4 of its last 5. From 1972 to 1982, LSU went 9-1-1 against the Rebels. Ole Miss only won three games in the series from 1972 to 1989. Brewer went 4-7 against LSU, but it didn’t seem like it. He was 4-1 against the Tigers when his team finished the regular season with a winning record, losing only in a 1989 upset. The win over the Tigers in Baton Rouge in 1986 gave LSU its only SEC loss on the season. Joe Lee Dunn beat the Tigers in 1994, one of only 2 conference wins (the other over Vanderbilt) in Dunn’s only year at Ole Miss. The Tigers welcomed Tommy Tuberville to the SEC by beating him 38-9 in his first game as head coach against LSU (which happened to be on the road), and 39-7 the next year. Tuberville would respond by beating LSU four times in a row, two at Ole Miss. The first time was an upset, one of only three losses by the Tigers in 1997. But after a 3-year bowl streak in which the Tigers went 26-9-1 overall, LSU reverted to early ’90s form with miserable years in 1998 and 1999. This enabled David Cutcliffe to beat the Tigers in his first contest against them as head coach and ran the Ole Miss winning streak to 3. In 2000, Nick Saban’s first season, the Tigers evened things out against Cutcliffe by winning in Oxford, 20-9. Cutcliffe, with Louisiana native Eli Manning at QB, again led his team to a win in Tiger Stadium in 2001, which brought his team to 6-1 (the loss to his predecessor on the road) and dropped LSU to 3-3. But fortunes dramatically reversed afterward. The Tigers won 7 in a row, winning the SEC Championship and Sugar Bowl, and the Rebels only won one game of their last four (over Vanderbilt). In all during this period, LSU was only 10-9 against Ole Miss. 2001 had marked the fourth Ole Miss win in 5 meetings and 7th in their last 12. The Rebels played LSU during another late-season collapse of theirs in 2002 but still only lost at Tiger Stadium by 1. They went on to win their final game in the Egg Bowl then beat Nebraska in the Independence Bowl. LSU, with a chance to return to the SEC Championship, lost by 1 in Little Rock, sending it to the Cotton Bowl and a loss to Texas. In the stoutest challenge the Tigers received in their national championship season (other than that from Ron Zook’s Gators, who beat LSU), the Rebels gave the Tigers all they could handle in a 17-14 loss at Oxford. It was Manning and the Rebels’ only loss in his last 9 games. In 2004 at Tiger Stadium, the Tigers finally evened out Cutcliffe’s record at 2-2. Although LSU would win 9 games in Saban’s final season and Ole Miss would only win 4 in Cutcliffe’s final season, it was another 3-point game, 27-24. I mark the decision to fire Cutcliffe (which I disagreed with at the time) as the beginning of Ole Miss’s recent troubles. 2005, Les Miles’ first season, is the first of only three exceptions to the close-win pattern in this group as LSU won 40-9, their 8th win in a row. In 2006, despite another lackluster season for Ole Miss and another 11-win season for LSU, the Rebels took the Tigers to overtime at Tiger Stadium. They accomplished this with a blocked extra point after what looked to be the winning drive by LSU. The Tigers avenged the 1998 loss, the only other in overtime, which was played at Ole Miss. Colt David, who had attempted the extra point, redeemed himself with a 26-yard field goal. That had been the fourth of five contests decided by 3 points or less, but LSU did not lose one of them. Ole Miss got a measure of vengeance with a big win in 2008 and the 2009 game which they barely survived. Then of course, LSU got another close win in 2010. The Tigers trailed with just 44 seconds left, as Stevan Ridley scored to give LSU its third distinct lead of the fourth quarter and fourth lead of the second half. For the Tigers, this ended a three-game losing streak against Houston Nutt, dating back to the 50-48 triple-overtime win by Arkansas over the Tigers in 2007. LSU then gave Houston a hell of a send-off with a 52-3 win in Oxford in 2011. It was both the most points either has scored in the state of Mississippi in the series (probably the most points LSU scored in a single game played in the state of Mississippi ever) and the largest margin of victory in series history by either team. The score was actually deceptively close as LSU did all it could to avoid scoring in the final possession. After a first-and-goal at the 1, the Tigers kneeled the ball four consecutive times. Ole Miss was 5-5 entering the 2012 game, and LSU was 8-2, but the Rebels were motivated. Ole Miss gave the Tigers a scare before LSU scored the winning touchdown with 15 seconds to go. The Rebels had led 28-20 after three quarters and 35-28 with 10 minutes to go in the game. The play of the game in my opinion was a Billy Cannon-esque 89-yard punt return down the right side of the field by Odell Beckham to tie the game at 35. Jalen Collins, whom Beckham went around when he first went left and then went right, was also instrumental in the return. A couple of possessions later, the Rebels had a chance to take the lead after getting a first and 10 at the LSU 18 but after sacks ended up with a 4th and 30 and only a missed 53-yard field goal attempt to show for it. LSU would parlay the resulting field position into the winning touchdown drive. Although Ole Miss out-gained LSU 463-427 (this did not factor in the punt return), the LSU defense was good when it mattered, allowing Ole Miss to gain only one first down (not counting another by penalty) in its last four possessions. I wrote my thoughts on the 2013 game here. Aside from the “Series Notes”. 2013 and 2014 are not reflected in some of the remarks above, but I am including them in the following: It was the ninth time in the last 13 games in the series that the game was decided by 7 points or fewer. In 2015, LSU entered the game with two consecutive losses after starting undefeated, and the Tigers’ struggles continued in a 38-17 loss. Ole Miss was coming off a bye week after an overtime loss to Arkansas two weeks before. The Arkansas loss ultimately cost the Rebels what would have been their first SEC Championship appearance. Both teams would win bowl games and finish with 3 losses (the Rebels lost a non-conference game against Memphis). Les Miles’ record against Ole Miss as LSU head coach finished at 7-4. In 2016, both teams were ranked; but the Rebels were again coming off a loss to Arkansas, this time without an intervening bye. LSU had won two in a row after elevating former Ole Miss coach Ed Orgeron to (interim) head coach. An LSU turnover allowed the Rebels to tie the game at 21 points apiece at the half, but the Tigers did not allow another point and won 38-21. In 2017, LSU rebounded from early losses to Mississippi St. and Troy by beating two ranked conference opponents in a row to become ranked themselves while the Rebels had struggled through a difficult offseason but were a respectable 3-3. Ole Miss kept the contest close through most of the game, but the Tigers pulled away early in the fourth quarter to go up by 21, eventually winning 40-24. LSU remains undefeated in games in the series with Ed Orgeron as head coach of either team. Orgeron had coached Ole Miss from 2005 to 2007, and the only noteworthy game of the series was the 2006 one mentioned above. After losing two in a row, the Tigers have won 6 of 8 contests since 2010 with both losses coming in Oxford. Since I only have a 3-day work week, I’m going to try to republish/update both the Ole Miss and Arkansas rivalry blogs this week; but I’ve been falling short of my blogging goals lately, so I’m not making any promises. Oregon fell two spots, but they had passed up LSU when both had played last week, so with Oregon idle, that shouldn’t be a surprise. I expect LSU to remain ahead if both win next week, but Oregon might still move ahead of the Tigers after the Civil War. Boise St. not only won over a decent team, but prior victims Oregon St. and Virginia Tech had big wins. Oregon of course hasn’t played the Beavers yet, but they have played USC, so they were harmed by that outcome. The good news for Oregon is they have two games left, unlike LSU and TCU. TCU will probably fall a few spots in the next two weeks. Oregon’s two remaining games (Arizona and Oregon St.) are also better than Boise St.’s two remaining games (Nevada and Utah St.). Ohio St. is not a threat to Oregon since the Buckeyes play only one more game against Michigan. Also, Michigan St. only has the one game left. Oklahoma St. could be a threat, but only if they beat Oklahoma and (likely) Nebraska. Oklahoma, Missouri, and Nebraska are probably too far back should any of them win the Big XII. Nos. 1 through 3 weren’t exactly impressive, but I don’t factor in margin of victory, and it’s hard to make up for having a loss. The discrepancy between TCU and Boise St. is mostly based on scheduling. Boise St. has three games left–two of them against fairly decent teams, Fresno St. and Nevada, and the other against Utah St. TCU has only New Mexico left, which is worse than Utah St. Also, it is certain that Oregon and LSU would more ahead of TCU by continuing to win. It’s harder to speculate about what the order might be among Boise St., TCU, and Oklahoma St., but if Oklahoma St. continues to win that would likely add Nebraska to the schedule, along with Oklahoma, who is already there. My guess would be that Oklahoma St. would move ahead of TCU and stay ahead of Boise St., but it could be close between Boise St. and Oklahoma St.
LSU should move ahead of Oregon if both win out, but it depends on how their opponents do in other games. I didn’t anticipate Oregon moving ahead of LSU this time, but past opponents did well enough (a big win was USC over Arizona, while LSU’s opponents had more mixed results) for Oregon that it happened. Arkansas is still on LSU’s schedule and that will count for more than Arizona. There isn’t as significant a difference between Ole Miss and Oregon St. LSU will move ahead next week though, since Oregon has a bye. I’ve mentioned this before, but with computer rankings, especially those like mine, week-to-week variations mean different things from what they mean in the polls. So the rankings are not saying LSU was better last week, and now Oregon is better, and next week LSU will be better. It’s based on what has happened so far, not with a view toward who goes ahead by the teams’ winning out. The carousel has continued at the bottom. USC moved in, knocking Arizona out. South Carolina moved in, knocking Florida out. A couple of the other changes were more indirect. Even though there was some shuffling with ACC teams, it was because North Carolina lost to Virginia Tech while Florida St. and North Carolina St. won (even though Wake Forest doesn’t count for much). Michigan moved up by virtues of others’ losses as well, since Purdue wasn’t worth a lot of points either. Most of the other changes were regular shifts based on schedule. The only currently top-25 teams who lost last week were Utah, Iowa, and Mississippi St., who were all just a little too high to fall out of the rankings. Please see the LSU-Alabama page for yearly entries from the past few seasons that will supplement this. *Game was tied with 4:11 remaining in third quarter. Alabama has leads in the series 53-25-5 overall, 23-16-2 in Alabama in general, 13-9 in Tuscaloosa, 28-9-2 in Baton Rouge, and 1-0-1 in New Orleans. LSU only leads in Mobile (2-1-1, the last meeting in 1958, the first game of Bear Bryant’s career at Alabama and of LSU’s last undefeated season). Since only winning twice from 1989 to 1999, inclusive, LSU had won 9 of 12 in the series before losing to the Tide in the BCS championship following the 2011 season. That means Alabama once led 42-16-5. The only periods of time comparable to that for LSU took place from 1946-58 (5-3-1) and 1982-88 (4-2-1). Apart from those time periods, LSU is only 7-40-3 against the Tide (including the three LSU losses since). Before 2013, LSU had won 5 of 6 and 8 of 12 in Tuscaloosa and 11 of 14 in the state of Alabama in general. 2010 and 2011 were only the third and fourth respective times that LSU beat an eventual 10-win Alabama team (the others being 1986 and 2005). 2017 was the 54th consecutive season LSU played Alabama. Alabama is the fifth-longest streak for LSU and third-longest current streak after only Mississippi St. and Ole Miss. The Kentucky streak was broken by the SEC in 2003, and the Tulane streak was ended by LSU in the 1995 season. Road teams are 24-10-1 in this series since 1981. I know what you might be thinking as far as “rivalry”–Alabama’s biggest rivals are Tennessee and Auburn. While this is true, LSU has had no such rivals in the conference since Tulane left after the 1965 season. LSU started playing Auburn and Arkansas consistently only when the SEC split into two divisions, which coincided with Arkansas’s joining the conference in 1992. (LSU and Arkansas did have a big rivalry before World War II.) Florida and LSU don’t have the same history insofar as battling for #1 in the conference as LSU and Alabama. LSU started playing Florida every year in 1971 and it wasn’t until 1983 that the Gators finished with fewer than 3 losses, and only once in that time period did they finish with 3. As for Ole Miss, that rivalry peaked in the 1960s–only twice since 1974 (1986 and 2003) have both teams finished with winning records in conference in the same season–and the Rebels have a natural rivalry with Miss St. anyway. I’ll start with series facts, transitioning into more narrative about the LSU/Alabama rivalry. Numbers don’t really prove a rivalry, but it is worth mentioning that Alabama is LSU’s 4th most commonly-played opponent and only one of the three series that were played more (Ole Miss) has been competitive lately (defined as three wins or more by the opponent over the last 10 games). The 2011 game was the 75th between LSU and Alabama. LSU is also fourth on Alabama’s list and the only more-played rivalry that has been competitive for Alabama lately is Tennessee. Alabama has played LSU more than it has played Auburn (at least since 1902). I had been adding something after each game, but I’m just going to say that even though the 2013 game looks as bad as the Jan. 2012 loss on the scoreboard, LSU was much more in the game. LSU fumbled away what should have been at least 10 points in the first half, and then LSU still had the ball deep in Alabama territory down 14 with about 10 minutes left. (The coaches made the right decision not to kick the field goal, but if the score were a good bit closer, they may have done so.) This is the first time Alabama has won 3 in a row over LSU since 1996. The Tigers have made the SEC championship game 5 times, but all were in odd-numbered years. LSU has played @Auburn and @Florida in every even-numbered year since the SEC championship game began. The Tigers have also hosted Alabama in even-numbered years that whole time and have generally fared worse against the Tide at home than on the road. For the eighth presidential election in a row, the LSU/Alabama game has corresponded with the outcome of the presidential election. It’s simple: LSU beats Alabama in an election year, the Republican wins; Alabama beats LSU, the Democrat wins. So if you don’t like Obama, blame Les Miles for getting him re-elected. The Alabama/LSU game often takes place after the election though. The game also has had added significance because of when it is played on the calendar. With only a handful of exceptions since this became an annual game in 1964, the game is played between November 3 and November 11 (election day falls between 11/2 and 11/8). From 2002 to 2005, it was played only slightly later in November (the latest being the 16th). In 1973, it was played on November 22; and in 1981, it was the opener for both teams. The 2011 bowl rematch was in January of course. The last time LSU was in a game where the only scoring was field goal(s), they lost to Alabama, 3-0, in 1979. Alabama won the national championship that year as the only major undefeated and untied team. Going back to 2011, Les Miles moved past Nick Saban in wins against Alabama, 5 to 4 (Miles admittedly leads Saban in losses against Alabama, 2-1). No other coach in LSU history had more than two wins against Alabama, although Bill Arnsparger (1984-86) was an impressive 2-0-1, the tie of course coming in Baton Rouge. If LSU can get past Arkansas, Miles will have a winning record with LSU against every SEC team except for Georgia (1-2). (That would have been true even had LSU lost this game though.) LSU has now won 11 of the last 15 against the Tide in the state of Alabama and 7 of 9 against the Tide overall. It’s just bizarre that LSU has as many wins in Tuscaloosa in this series as in Baton Rouge despite playing about half as many games in Tuscaloosa. The two teams are tied in their last 31 games (15-15-1), their last 29 games (14-14-1), their last 27 games (13-13-1), and their last 22 games (11-11) against one another. One more thing: LSU now leads in overtimes in the series, 2-1. The Tigers had won in 2005 (in Tuscaloosa, of course) and lost in 2008 (in Baton Rouge, of course). During the game last week, the trivia question was, “Which LSU coach has the most wins against Alabama,” with the predictable answer, Nick Saban. With the win incidentally, he was tied by Les Miles, who is now 4-2 against the Tide. Saban was 4-1, although to be fair to Miles, Alabama wasn’t as hard to beat back then. For instance, in Saban’s first year, the Tigers lost to Alabama-Birmingham before beating the Tide. After the trivia question, they then showed the list of LSU coaches and in a tie for third (with two wins) is Charlie McClendon, who coached LSU for 16 seasons. The most frustrating period of the rivalry for LSU was 1967 to 1977, during which LSU lost 2 games or fewer in conference 8 times. One of the years (1970), the Tigers finished undefeated (although with three non-conference losses, including in the bowl game). In the rest of the years, with one exception (1969, in Baton Rouge), LSU lost to Alabama. In each of the other three years in that time frame, LSU lost to Alabama. In 1972, both teams finished with one loss in the conference, but LSU finished third rather than first because of the loss. In 1973, LSU was one of two teams to finish the SEC with less than 3 conference losses: LSU lost 1, and Bama lost none. In 1979, LSU would have finished in a tie for first had it beaten Bama, to whom the Tigers had lost 3-0 at home. 1979 was McClendon’s last season at LSU. Had LSU beaten rather than tied Bama in 1985 (Bill Arnsparger was the coach by that time), LSU would have also tied for first. In 1986, the tables turned: the LSU/Bama game proved to be decisive, but LSU won this time. In only three seasons (1984-86), Arnsparger won 2 games against Alabama himself. Arnsparger was the only LSU coach between McClendon and Saban (20 seasons under 5 different coaches who faced the Tide) who beat Alabama more than once. In 1987, the Tigers’ only loss all season was to Alabama, without which the Tigers of course would have repeated. LSU tied for the championship in 1988 and then didn’t make a bowl game until until 1995. Admittedly that cooled off the rivalry, but those 20 years still weren’t exactly a distant memory. Even when LSU only lost 6 games from 1995 to 1997, two of them were to Alabama. There were some big games in the 1990s and early 2000s though. LSU was the first team to beat Alabama after the Tide’s 1992 national championship, putting an end to a 30-game undefeated streak. Then in 1996, LSU lost the SEC West due to the head-to-head tie-breaker in favor of Alabama. In 1997, LSU finally beat rivals Alabama and Florida, but losses to Auburn and Ole Miss kept the Tigers out of the SEC championship game. LSU won in Tuscaloosa for their first win against Alabama since 1993 and only their second since 1988. Although otherwise unremarkable, 2000 was a big win for LSU because it was LSU’s first home win against Alabama since 1969. Bama only won 3 games that year and LSU won 7, but the Tigers still only beat the Tide by 2. And of course in 2005, LSU was the first team to beat Bama, who had started 9-0. I’ll get to comparisons of the recent Alabama coaches, a few of whom coached against LSU at other schools. Other connections include Curley Hallman, whose biggest win as LSU head coach was over Alabama in 1993 (in terms of winning percentage, he was easily the worst LSU head coach of more than 10 games in history). He was an assistant at Alabama for Bryant after playing at Texas A&M under Gene Stallings, who was Alabama’s coach in 1993. Sylvester Croom and Jackie Sherill, both of whom LSU gave fits at Mississippi St. (Sherill also coached at A&M, where he was 0-3 against LSU), had played for successful Alabama teams. Alabama coaches Ray Perkins and Mike Shula had played for Bryant as well, although neither did particularly well as head coaches against LSU either. His match-up against LSU while he was at Michigan St. consisted of the 1995 Independence Bowl, in the first year of his predecessor Gerry DiNardo. LSU was 6-4-1 entering the game, having finished fourth in the SEC West. Michigan St. was also 6-4-1 and had finished fifth in the Big Ten in Saban’s first year there. LSU won the game, 45-26. Although LSU had the crowd on its side, which may have helped the margin of victory, this probably did not affect the outcome. In Saban’s first season (2000), LSU beat Alabama in Baton Rouge for the first time since 1969. Although LSU would finish with an 8-4 record and Alabama would finish 3-8, the Tigers only won 30-28. But the Tide was right back to normal in Tiger Stadium in 2002, winning 31-0, Saban’s only loss to the Tide. LSU won the other games against Alabama in Saban’s tenure by at least 14 points each. His only game of note against the Tigers was a 16-13 overtime loss for the Tide’s first loss in 2005, which so happened to be Les Miles’ first year. The game was Miles’ first win over a top ten opponent at LSU. LSU was 2-1 in overtime games that year (beating Auburn and losing to Tennessee, both at home). The contest was the only time Shula lost to LSU by less than 14. In the game, Alabama led 10-0 in the second quarter after Brodie Croyle connected with DJ Hall. In the first half, the #3 Tide out-gained the #5 Tigers, 207-72, and only allowed 5 first downs. LSU opened the second half with a nine-play, 80-yard drive and kept the Tide from getting another first down until they tied the game on a 42-yard field goal with 5:46 left in the third quarter. Not much offense ensued, although LSU would miss three subsequent field goal attempts, and the game went to OT tied at 10. After Alabama got the opening possession and kicked a field goal, LSU decided not to rely on kicking anymore, and JaMarcus Russell threw the game-winning, 11-yard pass to Dwayne Bowe. Russell finished at 16-30 for 229 and no interceptions. Alabama out-gained LSU for the game, 284-275, and had more first downs, 20-16. As a side note, Croyle and Bowe are both Kansas City Chiefs now. Franchione’s two seasons at Alabama coincided with Nick Saban’s second and third at LSU. The Tide lost to the eventual SEC Champions, 35-21, at home in 2001. Alabama’s 31-0 win in 2002 took place as the Tide finished the season 10-3 by winning 6 of its last 7. The Tide were ineligible for a bowl game that year, and LSU would lose to Texas in the Cotton Bowl to finish 8-5. Franchione is the third coach (at least that I know of) to coach both Alabama and A&M; but the LSU/A&M rivalry was discontinued after 1995, so he never coached against LSU while there. DuBose lost his first game against LSU, 27-0, in 1997, when LSU would finish 9-3 and Alabama 4-7. DuBose’s teams then beat LSU by 6 each of the next two years, however, LSU only won a combined 7 games in those two years while the Tide won a combined 17. Those two wins were of course followed by Saban’s first season at LSU, in which the Tigers won. Somewhat dampening the mood surrounding the end of the Tide’s 15-game unbeaten streak in Baton Rouge for Tiger fans was the fact that Bama didn’t win any road games at all that year. I mentioned the 1993 game above. LSU also came close to a huge upset in 1991. The Tigers would finish with a losing record and Alabama would finish 11-1, but Bama only won 20-17 at Tiger Stadium. The only other game that was close (decided by fewer than eighteen) in the Stallings era was in 1995 when the Tide won 10-3 to avenge the end of its 31-game unbeaten streak in the previous contest in Tuscaloosa. Stallings’ one win against LSU while at A&M was one of only two wins that season, the other against Wichita St. (which stopped having a football team in 1986), in 1970, a year in which LSU would win the SEC outright. The Tigers have not gone unbeaten in the SEC since. All contests against the Tigers during his time in College Station were played in Baton Rouge. Stallings had only one winning record in his seven seasons with the Aggies, beating Alabama in the Cotton Bowl after the 1967 season (Curley Hallman grabbed two Ken Stabler intereceptions in that game). LSU, who eventually won the Sugar Bowl that year, beat the Aggies, 17-6. The tie took place in 1966, in unremarkable 5-4-1 and 4-5-1 respective seasons, except it was remarkable in the fact that it was LSU’s worst season between 1961 and 1980. In 1987, Curry’s first season, his team defeated LSU, 22-10, in Baton Rouge but did not win another game and finished 7-5. LSU, on the other hand, finished 10-1-1, and as a result of the loss, came in second to Auburn. In 1988 (also extensively discussed in the LSU/Auburn rivalry blog), the Tigers continued their run to the SEC co-championship (with Auburn) by beating the Tide, 19-18, in Tuscaloosa. In 1989, Curry’s team beat the Tigers to go 9-0 on the way to a 10-0 start, 32-16. This coincided with only the third losing season for LSU since 1956. LSU continued its losing ways almost throughout Curry’s tenure at Kentucky, but the Wildcats didn’t fare much better. 1992 and 1994 were probably the sorriest match-ups during that period. 1992 was Curry’s only win with the Cats in Baton Rouge, but LSU would finish 2-9 and Kentucky would finish 4-7. In 1994, Kentucky’s lone win of the season was over Louisville in the opener. They still managed to make it close against LSU, losing 17-13 in Baton Rouge. LSU finished 4-7. In 1993, Curry’s most successful season at Kentucky (6-6, with a loss to Clemson in the Peach Bowl), Kentucky won 35-17. Although LSU would finish 7-4-1 in 1995, the Tigers lost to Kentucky, who would finish 4-7, anyway. LSU made the unfortunate decision to wear purple pants for the game. And rather than causing Kentucky to avert its eyes for the entire contest, it seemed to make the Tigers self-conscious. I don’t think LSU has worn purple pants since. The final was 24-16 in Lexington. Curry had another 4-7 campaign in his final year, but LSU, on its way to a 10-2 record, had no problem with the Cats this time, 41-14. Both home games against the Tigers were played in Birmingham and both were losses. No contest against LSU while Perkins was at Alabama was decided by less than 6 points. Alabama won by 6 in 1983, then LSU won by 2 in 1984 and by 4 in 1986. 1986 was Perkins’ final year, and after a 7-0 start, the Tide lost 3 of its last 5 regular-season games, to Penn St., LSU, and Auburn, before winning the Sun Bowl over Washington. 1986 was LSU’s most recent outright SEC title before Nick Saban came to Baton Rouge. For his career, he was 20-5-1 against the Tigers with a total of 6 shutouts. The head coach of Kentucky the first time the Wildcats played LSU was none other than Bear Bryant, who always seemed to give the Tigers trouble. His teams shut out the Tigers the first two times he faced them, before LSU beat Kentucky in his second-to-last season there and tied them in his last. LSU-Kentucky was a yearly rivalry from that time until 2003, after the SEC decided on one permanent inter-division rivalry per team. His success in the LSU-Alabama series is despite the fact that he lost to the Tigers, 13-3, at Mobile in 1958, his first season at Alabama. LSU won the national championship that year, and the Tide finished 5-4-1 and only 3-4-1 in conference. Still, it was a vast improvement over the previous three years, in which Bama had only won four games combined. To go back to LSU coaches for a second, the 1958 win was the second in a row over Alabama for LSU coach Paul Dietzel. The only subsequent LSU coaches to do so have been Charles McClendon (1969 & 1970), Nick Saban (2000 & 2001 and 2003 & 2004), and Les Miles (2005-07). Dietzel did not lose to Alabama, but he did not face the Tide (at least not with LSU) after that 1958 game. The Tide would win a national championship of its own in 1961 but wouldn’t be able to return the favor against the Tigers until 1964, a 10-1 season in which Alabama won the polls but lost the bowl game. Alabama, LSU, and Ole Miss were unofficial national co-champions in 1962, when USC won the major polls as well as the vast majority of other ranking systems for its first national championship. 1962 was LSU’s last claim to a national championship, recognized by the NCAA anyway, until 2003; but Alabama would get several and beat LSU often for the remainder of its contests against them under Bryant. LSU’s only subsequent wins over Bear Bryant were 1969, 1970, and 1982. Despite his claim that playing at Tiger Stadium was like playing inside a drum, he was 10-1-1 there overall and 8-1 with the Tide. LSU was 3-8 against Bryant in the state of Alabama. Just to comment briefly on the turnover, the #21+ teams, led by the ACC, keep beating each other up. The second-tier SEC and Big XII teams are keeping the cycle going as well. As for the top 10, I didn’t get a chance to re-post the Alabama-LSU rivalry post (my personally favorite LSU rivalry), but this way the recent games will end on a positive. I don’t plan to have much to say about the ULM game, so there is no reason not to post about the rivalry in the next week. I’ll also get more into specifics on the last game. I did write a pre-game blog, and I just added some comments (in the “responses” section) as well. I’ve had LSU higher than Alabama almost all season, and a lot of people thought this was an injection of bias in some way (even when I went to the computers, I was accused of rigging my formula to put LSU higher). But the fact is Nick Saban is not a miracle worker, and once again, inexperience was evident on his defense, particularly in the secondary. One might have been deluded, as ESPN’s Jesse Palmer (an Alabama alumnus) was, into thinking Stephen Garcia went 17-20 because he was just that impossibly good that day and that therefore this was not a reflection on any weakness by Alabama. (Sort of like when a basketball team can’t miss a three-pointer, you can’t always blame the defense.) But maybe that should be re-thought now that Garcia went 14-29 against Arkansas on the same day that Jordan Jefferson went 10-13 for 141 yards (1 TD, no INT) against Alabama, the same Jordan Jefferson who had averaged 51 passing yards and one interception per game over his previous four starts and who had not thrown a touchdown pass since Week 1. This wasn’t one of those one-yard, backfield touchdown passes either: if was for 75 yards. Not that projections are at all the point of my ratings, but admittedly I’m not confident that LSU would beat Oregon (mostly because there are similar offensive capabilities to Auburn’s). I do know that Oregon hasn’t faced an SEC-quality defense though. Right now, LSU is 4-1 against the top 25 and Oregon is 1-0. I’m not going to apologize for the 4-1 team being higher. Again, if I can draw a basketball analogy, few would doubt having the 4-1 team higher in a debate over seeding in the NCAA tournament (the 4-1 team would be in the ACC or Big East and the 1-0 team would be in a “mid-major,” or in a major conference in a bad year, but there are 30-something games in basketball). But in football, of course, people have this absurd idea of a regular-season playoff. So if Utah had beaten TCU, Auburn had lost one of their 3-point contests, Boise St. had lost to Virginia Tech, Stanford had held on against Oregon, and USC had held on against Stanford, Utah would be the deserving #1 team right now? I don’t think many people outside of Utah would be saying that. To be fair, Oregon’s schedule is slightly better than Utah’s (91 rather than 106), but that doesn’t factor in Oregon’s FCS/I-AA game; Utah had no such game. On the other hand, LSU’s FBS/I-A schedule is 3rd. Of course, that’s part of my formula, but just looking at opponents’ cumulative record makes my case as well. LSU’s FBS/I-A opponents have won over 61% of their games (this includes their games against LSU), good for 12th, while Oregon’s have won 40.5%, “good” for 103rd. Oregon does have an opportunity to gain some ground with LSU about to play ULM and Ole Miss, but it may not be enough if both teams go undefeated the rest of the way. Oregon and Boise St. have both made good jumps simply by playing decent teams lately, even though Washington and Hawaii, respectively, are hardly great. Boise St. has only one opponent left (Nevada) that might be of much help though, at least relative to other teams near them. TCU has San Diego St. next week, but they will gain almost no points afterward. The Horned Frogs have a bye week after that, and then they play New Mexico, one of the 10 worst teams (also a prior opponent of Oregon) to close out their regular season. The Mountain West, of course, does not have a championship game. Last week was probably it. Michigan St. has only Penn St. and Purdue left. Penn St. has been playing better as of late, but I don’t see the Spartans moving up without some losses by other teams. I think Oklahoma St., Nebraska, Ohio St., and Stanford are ranked appropriately. I still don’t understand how Nebraska lost to Texas, but they have the wins to make up for it relative to Ohio St. and Stanford, who each have a very respectable loss but lack in quality wins. I know Nebraska beat Oklahoma St., but is a loss to Nebraska more understandable than a loss to Texas? I think so. If you think Wisconsin, the only other team that seems to still be in the running for a BCS title, should be higher, just consider their out-of-conference schedule: UNLV, San Jose St., Arizona St., Austin Peay. Let’s just say I’m a tad annoyed that the BCS-related polls have the Badgers higher than LSU, although I think the computers will come through for the Tigers.